Discovering that you have diabetes is a life changing event that many people who are not familiar with diabetes don't always quite grasp. In a world with so many life threatening diseases and illnesses, diabetes actually tops the charts in the number of people affected by either Type I or Type II diabetes. The question you will need to ask yourself is if you are going to let diabetes control your world or if you are going to continue to live a full life with diabetes. If left untreated, diabetes can and will become dangerous. Untreated or mistreated diabetes is known to cause nerve damage that can lead to blindness or stroke or cause irreparable damage to your major organs. When a diabetic reaches a hypoglycemic state, seizures, strokes and even brain damage can occur. Yet all of these things are avoidable if you are proactive in treating and living with diabetes. For starters there are numerous ways to keep stick with your nutrition plan and actually keep that plan with you, regardless of where you go. For instance, the Fit & Fresh Food Containers are a great way to keep good foods at your fingertips at home and on the go. Portion control is made easy with the Smart Portion Prep Center and kept handy in the Prep and Pack Tray . Along with the salad shakers, drink mixers and shaker cups, the Fit & Fresh Food Containers and Shakers make getting the fuel your body needs in the right proportion every time, simple as can be. Keeping a Polar Bear Lunch Cooler handy helps keep things cold and refreshing too. When it comes to traveling with your insulin, you have to find the best way to keep things cool. For this very important responsibility, the possibilities are pretty great. FRIO has an extended line of cooling wallets that come in a variety of sizes and are quite reasonably priced. These cooling wallets generally keep medications cool for a little under 48 hours. For longer cooling action, Dia Pak also has a wondrous line of organizers and carriers that come in a variety of versions from basic to deluxe. These packs are great for longer journeys. Yes! You can take that family vacation. 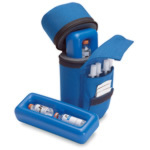 There is even the Everyday Diabetes Organizer that is great for daily use to keep all your diabetes testing supplies and insulin supplies together and accessible. We had mentioned the Polar Bear coolers earlier and Polar Bear also provides a line of medical coolers for efficient cooling as well. If you have other diabetes medical supplies and need a great way of transporting and even organizing them so that diabetes doesn’t cause a ripple in your day to day plans, there are also a great variety of medicine organizers to help you keep on track. There are Meditray and 7 day Mediplanners that can ensure you do not over or under medicate and negatively affect your diabetes. Also handy to have on hand are pill crushers and pill splitters for adjusting your medication levels. Living with diabetes doesn't have to be a struggle and even though you may not think so, learning that you have diabetes should open the door to living in a whole new, healthier way. With the right nutrition and medications, you can maintain your health and with the right diabetes accessories, you can keep on the independent living track of your dreams. This article was published on Thursday 27 May, 2010.